Battery (accumulator or just accu) serve to supply electric power to start vehicle engine. Battery power will be recharged up by alternator when engine is running. 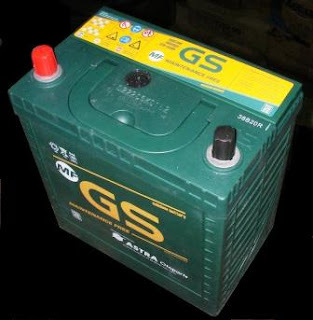 Currently two types of batteries are available in the market, namely wet batteries and dry batteries. Wet batteries have liquid electrolyte which must be maintained in quantity. Make sure the electrolyte in wet batteries are always in between the upper level and lower level. If the liquid is low, then add distilled water, do not add battery acid. Battery acid is only added for a new battery. Distilled water is better as it is pure water and does not contain minerals that can contaminate battery cells. Distillate water can be made by trapping rain water and collect it by dust free plastic funnel and bottle, do not expose to metal as metal can react with water and lower water purity. Distillate water can also be produced by sunlight as mentioned in article: Simple Solar Water Distiller. If water has lower acidity, this is because water content has been settled in battery cells. Recharging the battery is an attempt to release deposit in battery cells and make it back into the water, or in other words reverse the chemical reaction of the battery. Battery generates electric current due to the acid reaction with battery cells. If the sediment is too much accumulated and for a long time in battery cells, it will be difficult to remove, so the battery should be replaced, no longer rechargeable. Maintenance free batteries may also need top up water, but with much fewer quantity. Maintenance free batteries have a special top lid that can condense water vapor and returned it back into the battery, see photo below. For dry cell battery, it doesnt need top up water because this battery does not contain a liquid electrolyte. It has electrolyte in paste form, not liquid, with only enough moisture in it to allow current to flow. Some are using gel (gel cell, gel battery), and some are using textile or mat to absorb electrolyte (Absorbed Glass Mat AGM). 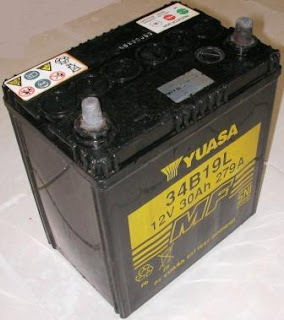 Photo below shows a type of dry cell battery, please note to the sealed top of battery, no holes at all. Alternator as a power plant on the vehicle, serves to recharge the battery and supply electric power to run a variety of vehicle accessories, such as: the ignition system on a gasoline engine, the engine management computer system, A/C, lights, radio/tape, power windows, etc..
the engine revolution will be too low to turn alternator to supply enough power to recharge the battery. In this case, the battery need to be recharged regularly, eg once a month for about 2 hours. Excessive accessories such as: high-power sound system, high-power head lights, lights under the vehicle as in 'Fast & Furious’ movie, etc.. Large electric power is required and it exceeds alternator power designed for that vehicles. Modification or replacement with a bigger alternator could be done. But the alternator is very expensive, and also alternator generally only works well with engine revolution above 1500 RPM. Therefore, battery power needs to be replenished regularly. Some accessories such as alarm, radio tape, clock, GPS, use an electrical current even when engine is turned off, often called the standby current or parasitic current. So it should be considered to replace battery with a larger one if too many accessories and drawing high-power, even when standby. You can measure the use of electric current when the vehicle is turned off with ammeters. If the standby current of 2 amperes, and the battery is a 40 ampere hours (AH), then the battery will be flat after 20 hours. Most vehicle are using only about 50 milliamps when standby. Some vehicles with a complex electronic system draws about 400 milliamps when the ignition key is removed. When the ignition key is in the Off position or removed, remove fuses one by one while monitoring the change in the ammeter reading, in order to find accessories that use a lot of current. If a large current flow through the fuse, then the ammeter reading will decrease when the fuse is disconnected. It can be done also by disconnecting the cable to accessories one by one to find the accessories with large current. Then check whether the standby currents are still in accordance with the specifications of that accessory. If the standby current is greater than specification, then there is the possibility of such a device having internal leakage. If no ampere meter available, it can be tested by removing one battery connector and put it back. If there is a pretty big sparks when connector is disconnected or connected, there is a possibility of electrical system draws too much current. Or there is current leakage that makes the battery flat. If it gets worse, it could cause shorting. It is necessary to recharge battery if the voltage is less than 12.6 volts. Battery with voltage about 12 volts has enought power to start the engine, but it’s lifespan will be reduced. Battery is considered fully charged when the voltage reaches 14 volts. Battery on a sedan that is usually used in the city with many traffic jams, usually last for about 1 year. After that, the battery can not be recharged anymore as it has a lot of sediment in it’s cells, so it must be replaced with a new battery. But if the battery is recharged on a regular basis when voltage drops below 12.6 volts, then battery lifespan will be much more extended, it can reach 5 years. Long life battery is good and economical, especially for vehicles with automatic transmission that can not be started by pushing it. Mf mas mau tanya, sya mau ngecas aki yb7a 12v/8a dengan adaptor 5a/output 13,8v. Berapa jam kah waktu pengecasannya? Terima kasih.